MEGAcquire is an exciting journey of strategy and luck through the corporate world. Live in the world of fun and fortune as you maneuver to outwit your opponents. Build and merge companies while shrewdly buying, trading, and selling stocks to become the wealthiest player. It was inspired by the Sid Sackson game of ACQUIRE and is designed to extend the experience of a treasured keepsake, while at the same time creating an atmosphere of competition that is undecided until the end. 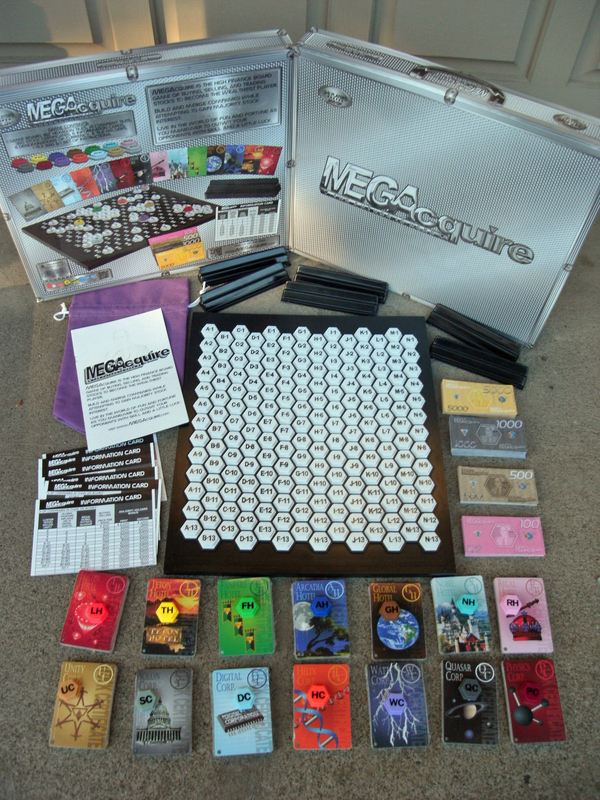 The game of MEGAcquire was created because I always envisioned a larger game of ACQUIRE, and I wanted it to be manufactured in a nice factory form instead of a hand-created version. I envisioned an ACQUIRE game that had more options, lasted longer, and made it more difficult to keep track of who was invested in what. With the help of Michael and Lisa Spahitz of Board Game Manufacturing, MEGAcquire became a reality. Michael made the suggestion early on that manufacturing possibilities allowed the tiles to be in a different shape other than square. His first suggestion was a hexagon. It was a beautiful idea that allowed connection on all sides of the tile. The final result has allowed the makeup of the board during game play to achieve some very interesting results. MEGAcquire increases the size of the game of ACQUIRE. With the hexagon configuration of the playing tiles, MEGAcquire also heightens the level of strategy. Opportunities to create, merge, and grow companies are 50% more likely for each tile, compared to the traditional square shape (six chances to connect instead of four). The size of the board and the number of available companies allows for an ebb and flow of power throughout the game. MEGAcquire will appeal to players of any age who like the feeling of power that is acquired through achievement. It is recommended for ages 13 and up, but cannot be limited in age because of the early possession of business savvy that can be found in many younger players. Average playing time is 2-3 hours, but shorter time limits can be set. In MEGAcquire, players increase their wealth by building companies, purchasing stock in those companies, and then growing those companies by placing connecting tiles to increase the size. Cash flow is mainly obtained through mergers, but can also be accomplished indirectly through the trading of stock certificates. It is not always prudent to have the most stock in the biggest company when you may be able to build and sell enough smaller companies to generate a larger amount of wealth. Many different strategies can be used to reach the pinnacle of success in the corporate world of MEGAcquire, but as in real life, it is always nice to have the "luck of the draw." MEGAcquire is best played with three to six players. Players begin the game with twelve tiles and $12,000. Players are allowed to purchase or trade up to six stock certificates per turn. MEGAcquire uses Lloyd’s Rules of Acquire. Game board, tiles, and tile holders (provided for game play convenience) are constructed from plastic. Stock certificates and information cards are wax coated. A tile bag has been included so that players can draw tiles from the bag instead of the pain-staking chore of turning all the tiles face down in the box. I wanted to make the game of MEGAcquire for my immediate family and friends, but because of the number of copies that had to be manufactured, I have been able to share this game with many others around the world. MEGAcquire has been sold in numerous states within the United States, and in numerous countries, such as Germany, Australia, Belgium, Brazil, Canada, Denmark, England, France, Guatemala, Indonesia, Luxembourg, Mexico, The Netherlands, South Korea, Switzerland, Vietnam, and Malaysia. The game of ACQUIRE, and now the game of MEGAcquire, are truly enjoyed around the world.